All transactions are safe and secure with a reliable history in online purchasing behind each of our associates. 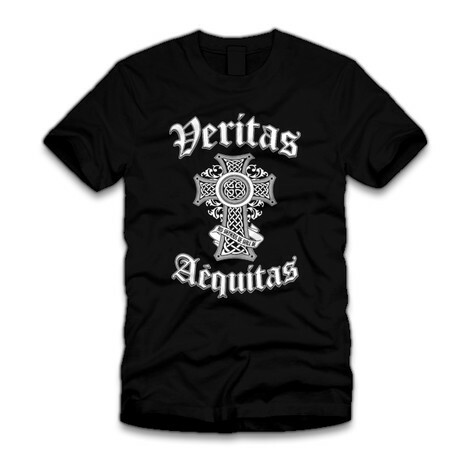 Buy the Veritas Aequitas Logo t-shirt to own Boondock Saints clothing and merchandise. This stylish green T displays a similar Veritas Aequitas logo to the one that can be seen in black on the Boondock Saints hoodie sweatshirt. Here, the white logo on green looks great, exuding an Irish tone that the brothers would be proud of, while still holding true to the feel of the movie. The Boondock Saints Rosary Cross can be seen at the center of the design. This tee will look great on St. Patrick's Day to go with your green beer. In addition to the Veritas Aequitas Logo tee above, browse the Boondock Saints Clothing Gallery for more apparel like men's and women's clothes, kids shirts or hoodies.